Feedback forms come in many different shapes and sizes. Applying these forms to your website can help you gauge which issues your customers are running into, why they are aren’t converting, and much more. They can be deployed on various pages and in a number of different ways, including via triggers such as exit intent, time on page or scrolling. What’s also advantageous about feedback forms is that they often include a short series of questions that will make it easy for your visitors to submit their feedback in detail without taking too much of their time. Note: feedback forms are not the same as surveys. Here’s why. What should you ask in your feedback forms? Depending on the goals you’ve set out for yourself in your feedback programme, there are a number of different metrics as well as research elements you can choose to work with and add to your feedback forms. For understanding / improving Customer Loyalty: Use Net Promoter Score (NPS) or Customer Satisfaction (CSAT) and open comments. For improving online (sales) funnels: Use Goal Completion Rate (GCR) or Customer Effort Score (CES) and open comments. For optimising ‘page’ usability: You can use a passive feedback form (e.g. a feedback button in the app navigation) or visual feedback (e.g. users can add a screenshot if things aren’t functioning properly). This is a more universal option for collecting feedback. Single line input/text area: for capturing open-ended feedback from users. Radio button/dropdown: With these elements users can only select one option (e.g. compliment, bug, suggestions, content, etc). Checkbox: this element enables users to collect multiple answers from visitors in case more than one option applies. Contact details: this is a great element for users who want to follow-up on feedback items. For more detailed information, be sure to check out our article on the 5 Types of Online Feedback Form Questions. The process for installing a feedback form in WordPress is quite simple. You will start by installing the Mopinion plugin via your WordPress account. Screenshot: Go to ‘Plugins’ in WordPress, search and download. Upon installation, a feedback button and form will automatically be implemented on the entire WordPress website for you. All that’s left is to customise the form and set up the desired triggers. The options for customising feedback forms include changing the language, editing the questions in the form itself, and choosing the design / look-and-feel (all according to the user’s goals). Once this is complete, forms can be set up so that they are triggered on particular parts of the website with the questions you want to ask. For example, on certain pages, posts or funnels. To do this, you will go to the Deployment section using your free Mopinion account (which is created upon installation of the plugin). All feedback that is collected is then assembled in your Mopinion inbox (which can be accessed here). Users can also choose to have feedback alerts sent straight to their email inbox. 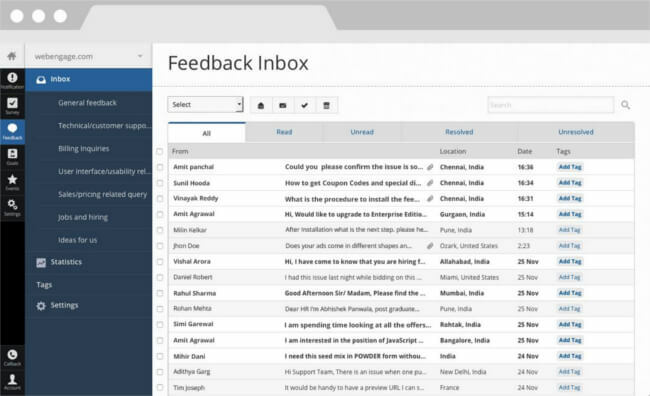 Screenshot: Mopinion inbox with feedback results. For more detailed information on the Mopinion feedback plugin in WordPress, click here. There are several alternative feedback plugins available in the WordPress plugin library. However, you’ll need to take a few factors into consideration first. Factors such as customisation capabilities, trigger options, analysis and reporting, and of course, the level of technical knowledge required to get your plugin up and running. 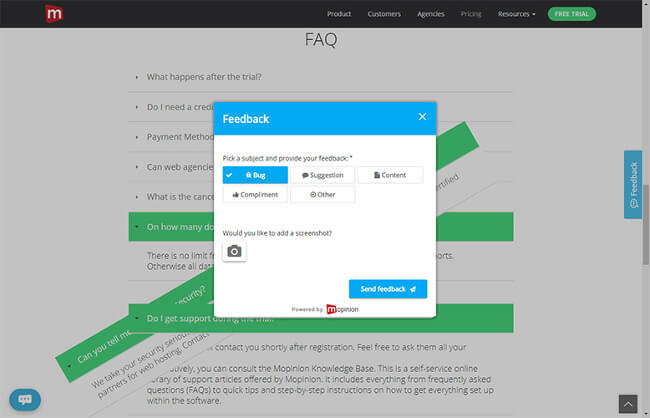 Surveys by Feedback is a free survey plugin that gives users direct access to user feedback. All incoming feedback is sent directly to the user’s inbox which means that their inbox has to be setup in a way that doesn’t automatically throw the feedback into their spam. The plugin is completely open source so users can download and modify the code as much as they want. 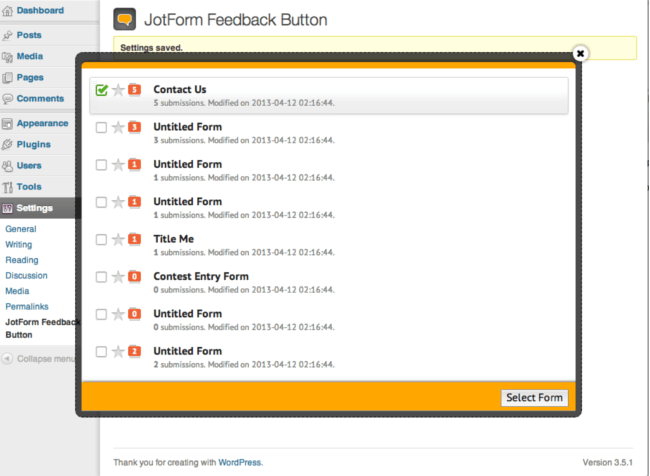 JotForm is the first web-based WYSIWYG form builder, which powers this feedback button plugin. It has an intuitive drag-and-drop interface which makes it very easy to create forms and customise them. Similar to Surveys by Feedback Cat, all feedback results are sent directly to the user’s email. This plugin is free up to 100 form submissions per month. Should the user go over that limit, they will need to upgrade to a Premium plan. For a more extensive list of plugins, click here. The best way to learn more about how your customers experience your website is to ask them. All of these user feedback plugins make that possible, but how do you which one is best for your website? 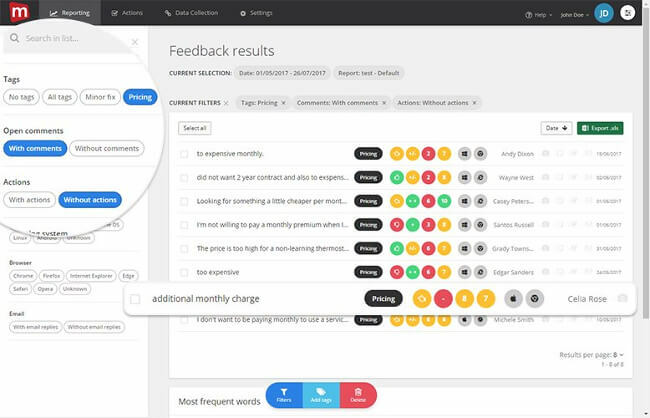 Many of the above mentioned plugins focus primarily on collecting feedback but lack the tools needed to customise feedback forms (e.g. with question types, design or language) and don’t even give you the means to analyse feedback. See how Mopinion’s plugin works for you! Note: the Mopinion plugin is a freemium option will be installed on your website immediately. This differs from the trial option (below) in that the trial, once expired after 14 days, will need to be implemented with a js tag manually.